The first iPhone is released by Apple Inc. 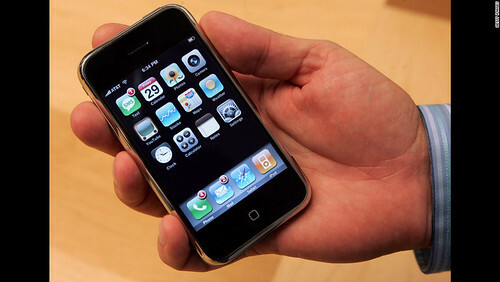 The iPhone is the first smartphone model designed and marketed by Apple Inc. It is the first generation of iPhone that was announced on January 9, 2007 after years of rumors and speculation.It was introduced in the United States on June 29, 2007, and it featured quad-band GSM cellular connectivity with GPRS and EDGE support for data transfer. On June 9, 2008, Apple announced its successor, the iPhone 3G. The original iPhone has not received software updates from Apple since iPhone OS (now iOS) 3.1.3. Since June 11, 2013, the original iPhone has been considered “obsolete” in Apple retail stores, “vintage” by other service providers in the US, and “obsolete” in all other regions.Apple does not service vintage or obsolete products, and replacement parts for obsolete products are not available to service providers. The iPhone was released on June 29, 2007 in the United States where thousands of people were reported to have waited outside Apple and AT&T retail stores days before the device’s launch; with many stores reporting stock shortages within an hour. To avoid repeating the problems of the PlayStation 3 launch, which caused burglaries and even a shooting, off-duty police officers were hired to guard stores overnight. It was later made available in the United Kingdom, France, Germany, Portugal, the Republic of Ireland and Austria in November 2007.Six out of ten Americans surveyed said they knew the iPhone was coming before its release.